From the rubble of a failed industrial world, comes a man destined to change the future. A bounty hunter in search of love and justice in a population full of mutants, freaks, and cannibals. Harvey Lewis: Oh hi Jon. Though both a perfect companion to "The Room" and a standout film in its own right, "Best F(r)iends" overall seems to be a meditation on the past fifteen years of Greg Sestero's life. But, that sentence should mean something to you before you watch this movie. Don't see this film yet if you haven't. It won't do anything for you, and worse, you'll never appreciate what inspired it. It says so right at the beginning of the film -- "Based On True Events." This two-volume film (which has a clear "intermission" moment at the end of Vol. 1) is really the final film in a loosely bound trilogy, which came together accidentally and incredulously. Now, if you are already well-versed in the mythology behind Sestero and his unforgettable counterpart Tommy Wiseau, you should see this film. I would go into it not knowing anything -- but the plot is classic California neo-noir and involves detailed, interwoven subplots. It's also a tribute to the beautiful city of Los Angeles, and the significance of Sestero's time there versus his time in San Francisco. Despite being a cult figure for fifteen years, this is Sestero's debut screenplay. At the wonderful Q&A I attended, he admitted that the script was written in only a few days, and inspired by both a fond (yet bizarre) memory and a cannabis edible. It lives up to this story and unfolds in a dreamlike manner, in which situational tones change rapidly and unexpectedly. Although clearly made on a limited budget, the film has simple yet effective cinematography. The direction is perfectly suited for both Sestero's script and Wiseau's acting, and there is a surprisingly great score by Daniel Platzman (of Imagine Dragons). It's a good movie. It's not an amazing movie, but that hardly matters. The important part is that you will discover there is major talent behind Sestero (who hopes to next write an unrelated horror-thriller). It's clear that he has the capability to become more than "the guy who played Mark," and this is him getting his feet wet. This his him laying "The Room" to rest. It's a first effort, and an impressive one. At the Q&A, Sestero explained that he wrote the characters of Jon and Harvey to be played specifically by himself and Tommy Wiseau. It was actually initially inspired by a memory of the two of them taking a road trip up the California coast, and Wiseau becoming paranoid that Sestero was going to kill him. Let me make myself abundantly clear -- there is absolutely no possible way for the characters in "Best F(r)iends" to be portrayed by other actors. The film would never work. To this point, it is clear that the film is a deep meditation on the complex relationship between these two men; one that has not always been great. Given this context, I personally found the first volume of "Best F(r)iends" to be beautiful and poetic. It's somewhat over-the-top; Wiseau really shines when he is playing a character that was (quite literally) written for him -- it's clear he's having fun, and it's refreshing to see him take on a more serious form of acting. He also seems to be acutely conscious of his image and the way his adoring fans see him, and is embracing his naturally eccentric personality. It's not ridiculous to say he can and will appear in more films in various roles. And the guy earned it. 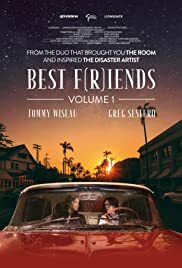 "Best F(r)iends" seems to suggest there is not much more to be said about the friendship between Sestero and Wiseau. It will always be there, and this two-part epic is its tribute. At the same time, it is being laid to rest in the cult circuit -- the memories will be there forever, but it's time to part ways and focus on the potentially incredible things that they create independent of one another. I am enthusiastically looking forward to Vol. 2.